The problem with being a Horror fanatic, it's truly hard to get scared anymore. That's the problem with our lead character, he's a Horror junkie who's just not getting that adrenaline kick anymore from being scared, that is until he's approached by a stranger who gives him a business card that will change everything. 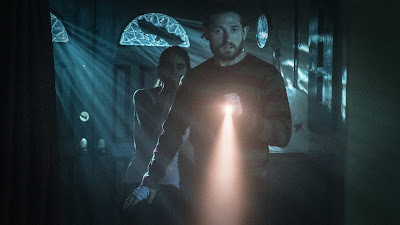 The premise for this film really grabbed my attention, It felt like it was written by a Horror fanatic for fellow Horror fanatics. That got me excited as it felt like this something that I could feel connected to and a change up from the usual. As much as I enjoyed this film it had a few problems that stopped it from being more than a one time watch, first of all our lead 'Lucas' is such an annoying character that when bad things start happening you find it hard to feel bad for the guy. Secondly the film can't seem to make up it's mind how to end and this lets it all finish on a bit of a whimper which is a disappointment as this film just doesn't reach the potential that it had, though I did enjoy the many references. "Fear, Inc." is a good one time watch but it does let itself down with some poor writing.